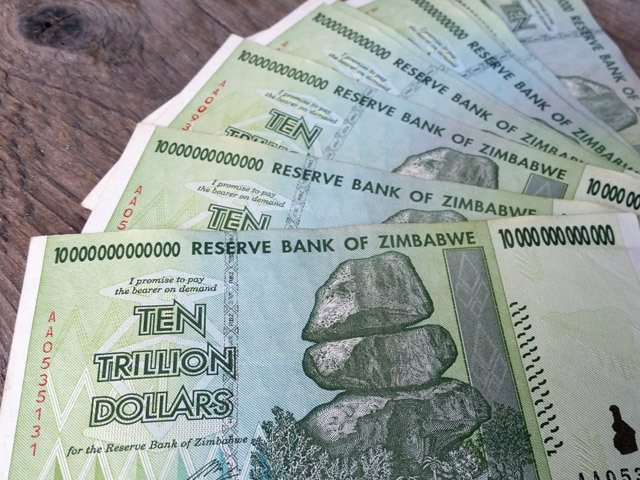 With the highest inflation rate in the world, Zimbabwe began printing extremely large denominations that are now entirely worthless outside of the novelty market. To keep up with hyperinflation to the tune of 231 million percent at it’s height, the Reserve Bank of Zimbabwe began printing ridiculously large notes like the $10 trillion bills in the photo above. Their largest denomination, the $100 trillion dollar bill, didn’t even get you a ride on a public bus to work for a week according to the Telegraph. The Zimbabwe currency was finally abandoned on April 12, 2009 for a multi-currency system, which dramatically dropped the inflation rate to -2.3%. In 2015 the Zimbabwean dollar was formally demonetized to zero, and the US dollar was officially adopted. At that time, the bank began exchanging Zimbabwean dollars for the new currency at a rate of 35 quadrillion (that’s 35 with 15 zeros) for one US dollar. Today the old Zimbabwe currency is entirely worthless, except as a novelty. $100 trillion in $10 trillion dollar bills cost me $30 bucks on ebay. A $100 trillion dollar bill will run you about $50. The Zimbabwe government has stated that it would only consider returning to the use of their old currency when “key economic fundamentals such productivity in key sectors have been achieved.” So if you buy some defunct bills now, maybe one day you’ll be a high roller in Zimbabwe.